There are many things that dads will do for their kids that they previously would never have thought of doing. At the risk of stereotyping, I doubt any guy without kids would spend a day on the couch watching a Dora the Explorer marathon. Neither would he play on the floor with plastic dinosaurs (at least, not with other grown-ups watching on). And he definitely, positively, would never paint his toenails purple. Of course, once we guys become dads, these “never ever” activities become “always” so long as they bring a smile to our kids’ faces. 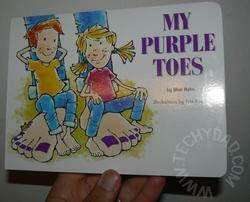 In My Purple Toes by Blair Hahn, the father of the story is introduced as having purple toenails. (This is explained in the forward as having happened when a dad brought his teenage daughter to a nail salon for a pedicure.) Instead of being embarassed by his colorful toes, he revels in them. He walks barefooted, showing off his purple toes, in all seasons (though his toes get cold in the winter) and enjoys spending time with his family and their non-purple toes. I read this book to both NHL and JSL. They both enjoyed the story as well as the little extras within it. (For example, there’s a purple-toed frog “hidden” on every page.) I also enjoyed that the book was interactive in that is asked the child questions (such as “Where are my purple toes?”). When I got to the end, JSL asked me to read it to him a second time. How could I refuse? In addition to their website, where you can purchase My Purple Toes for $10.99, the author also has a Twitter and Facebook presence. (No word on whether he tweets with purple fingernails.) Also, a second book, titled My Purple Kisses, should be released in time for Valentine’s Day 2011. Finally, a portion of the proceeds from My Purple Toes goes to the nonprofit organization Soles4Souls which collects and distributes shoes free of charge to people in need. Disclaimer: I did this review as part of a campaign on Family Review Network for My Purple Toes. I received a complimentary copy of My Purple Toes to facilitate my review. The opinions expressed here are my own and no other compensation was received.